We are each an essential part of the world. That’s why we impart an international perspective and teach diverse ideas at St. Mary’s School. Students here step outside of their familiar experience so that they might see through the eyes of others. That’s not a question of standing aside from the place and culture in which you were raised, but of gaining the perspective that allows you to appreciate who you are, who you will become and why. Our curriculum is uniquely suited to developing internationally-minded people who recognize their common humanity and joint guardianship of our shared planet. Our goals are aspirational. At St. Mary’s School, success is found hand-in-hand with the growing world, in partnership with teachers, our peers, our families and the community. Together, we are joined in pursuit of a common, better future. Our full slate of outwardly-minded educational opportunities include our International Field Studies program, through which students travel to Costa Rica, Hong Kong/China and France. Our Student Exchange Program brings students from the International School of Milan into our homes and then invites St. Mary’s School students to Italy for home-stay and extended travel. AN ESSENTIAL PART OF THE WORLD 12 countries represented in the student body 3 foreign languages taught as core subjects—CHINESE FRENCH SPANISH, 6 exploratory subjects connected to core subjects—SCIENCE TECH THEATER ART MUSIC PHYS ED, 29 sports teams fielded, teaching skills, sportsmanship and leadership, RELIGIONS-12 represented in the student body. A student can read about the Italian Renaissance or watch a video about the ocean, but it does not have the same impact as seeing the sculptures and paintings in Italy or enjoying the marvels at an aquarium. Our unique Field Studies program integrates academic content areas into a realistic approach to learning beyond the classroom environment. Through one-day field trips or weeklong field studies, students experience learning among a natural setting, reinforcing the concepts taught in the classroom. This program offers distinctive opportunities for observation, research and interaction all within native settings. Field studies build responsible and cooperative learning that occurs in real-world situations to provide academic enhancement while creating cultural awareness amidst historic and educational settings. Students embark on a field study to Sacramento, our State Capital, to reinforce the IB unit of inquiry “How We Organize Ourselves.” The central idea looks into natural resources, boomtowns, the discovery of precious minerals and the effect on the area and the people. Students visit the Capitol Building, Sutter’s Fort, the California State Railroad Museum, and other historic sites, including a chance to explore mines of the Mother Lode and the original gold discovery site in Coloma. Students spend three days at Astro Camp focusing on various astronomy and physical science including rocketry, rock climbing, microgravity snorkeling and many other team building activities. The experience is designed to sharpen student interest in the scientific study of the universe and directly connects with the IB Unit of Inquiry on Space and Exploration. Each fall, St. Mary’s sixth-grade students attend a four-day field study at Santa Catalina Island to close an IB Unit of Inquiry investigation into oceans. The journey to Howlands Landing with Catalina Environmental Leadership Program allows students opportunities for marine and terrestrial field research. Rich program offerings like marine snorkeling, kayaking, investigating tide pools, hiking, researching in a kelp lab and composting help foster environmental stewardship, peer relationships, and self-confidence. Students spend a week experiencing the dramatic landscapes of Yosemite National Park under the guidance of the Nature Bridge at Yosemite Program. They explore the valley floor, wander through meadows, and challenge themselves to reach the tops of waterfalls. In the process, connections are made across the curriculum including Life Science and Ecology, Cultural History, Literature, Current Environmental Issues, Art, and Physical Endurance. Grade 8: Williamsburg, Virginia and Washington, D.C.
Students explore the earliest roots of our nation as they follow a historic trail from Colonial Williamsburg, Virginia to Washington, D.C. This trip presents a fascinating look at how America developed as a nation and ties into several units of inquiry as well as subject matter ranging from math to history to politics. Students accompanied by a parent chaperone travel to the Big Apple to experience multiple cultural venues including the Frick Collection, the Guggenheim Museum— where student take apart in a hands-on workshop relevant to current featured exhibitions— and the Metropolitan Museum of Art where students visit galleries that highlight IB units of inquiry. Performing arts experiences include a night at Carnegie Hall, Jazz at Lincoln Center, contemporary dance or traditional ballet as well as a Broadway show. Students also enjoy multicultural dining experiences, such as Sofrito, the Russian Tea Room, Café Un-Deux-Trois and Café Fierello. Travelers navigate the city on foot and by the subway and the bus systems. St. Mary’s is pleased to offer four international field study opportunities. Field studies are a critical aspect of the IB curriculum and we want to continually enhance the experiences we offer to our students. 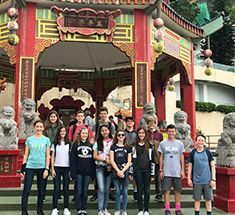 In addition to our Italian exchange program, we offer three field study destinations: China/Hong Kong, France and Costa Rica. These trips are designed to enhance student learning and promote personal growth. Please note that preference will be given to students in eighth grade and students enrolled in the target languages. St. Mary’s partners with the International School of Milan (ISM) to provide an exchange program for both of our schools. ISM, a Kindergarten to Grade 12 World School, is the largest international school in Italy. This dynamic exchange program helps students develop internationally-minded attitudes, experience new perspectives, gain in-depth knowledge of Italian culture and create friendships and memories that last a lifetime. This unique partnership offers St. Mary’s families the opportunity to host an ISM student in their homes. Later, our students journey to Milan where they reconnect with ISM students while staying in host family homes and attending ISM. During their travels, students will tour Rome, Florence, Venice and Pisa and explore Ancient Roman, Medieval and Renaissance historical sites, experience the great art and architecture found there, and embrace the wonderful culture, cuisine and customs of the area. The tour is inspired by and supports the middle school history curriculum. The China and Hong Kong field study is an amazing opportunity for students to use their language skills and be immersed in the Chinese culture. Our first stop is Beijing, the capital of China, which is one of the world's oldest cities. Our private tour includes Tiananmen Square, Forbidden City, Temple of Heaven, Summer Palace, Kunming Lake and the amazing Great Wall. Additional activities include an authentic cooking class, a traditional Chinese calligraphy class, as well as a demonstration of Tai Chi. Next, the group will travel to Hong Kong, which is a modern city with a unique blend of Chinese culture mixed with British influence. Highlights of our private tour include riding the tram to Victoria Peak, visiting the largest Buddha at the Po Lin Monastery and spending the day at Ocean Park. Join us for a once-in-a-lifetime journey as we travel and experience the very best of Beijing and Hong Kong. Not only will students have an opportunity to use their language skills, but more importantly students will gain an appreciation for the Chinese culture while developing skills to become global citizens. The trip to China and Hong Kong is only available every other year. The France field study offers a fun and enriching experience into the history and culture of France. 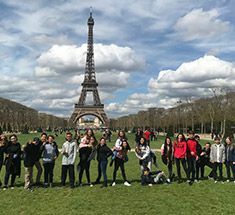 Students embark on a journey throughout Paris’ famous landmarks: The Louvre, Champs Élysées, Arc de Triomphe, Notre Dame Cathedral, and the unforgettable ascending of the Eiffel Tower. The experience also includes a visit to The Chateau de Versailles, Monet’s gardens in Giverny, and a trip to the countryside and Normandy, where we will gain personal and historical perspectives on the experiences of WWII soldiers. We will visit D-Day beaches, the Memorial Museum and the American Military Cemetery and pause to pay our respect to the soldiers. The south of France and Monaco are also part of our itinerary. Students experience all the beauty France has to offer: the language, the picturesque scenery and the famous French cuisine while walking in the footsteps of Louis XIV, Napoleon and Victor Hugo. C’est la vie! The St. Mary's field study to Costa Rica offers our students the irreplaceable opportunity to immerse themselves in the language, the culture, the green lifestyle and the positive mentality of this wonderful Spanish-speaking country. With the rainforest, the countless rivers and the vast flora and fauna in the background, our students take part in daily activities aimed at expanding not only their knowledge and their personal experiences but their understanding of the world as well. Our students explore, discover, learn, build relationships and engage in meaningful and sustainable service. At the core of this field study is the collaboration and partnership that we have with the Monte Sion School, which is located in the Cabecar indigenous region. Here, St. Mary's students and chaperones work hand-in-hand with all members of the school community making improvements to the school. Our travels take us from Rancho Margot, nestled between rain and cloud forests in a UNESCO biosphere reserve at the foot of the Arenal Volcano, to Puerto Viejo and the Gandoca Manzanillo National Wildlife Refuge by the Caribbean Sea. Throughout our journey, we meet local and global leaders and visionaries who deeply care for the protection of the environment and inspire us to make the world a better place to live in. All of this while having the time of our lives. ¡Pura Vida!